St Mary’s was divided into St Mary’s and St Nicholas’ (1991). 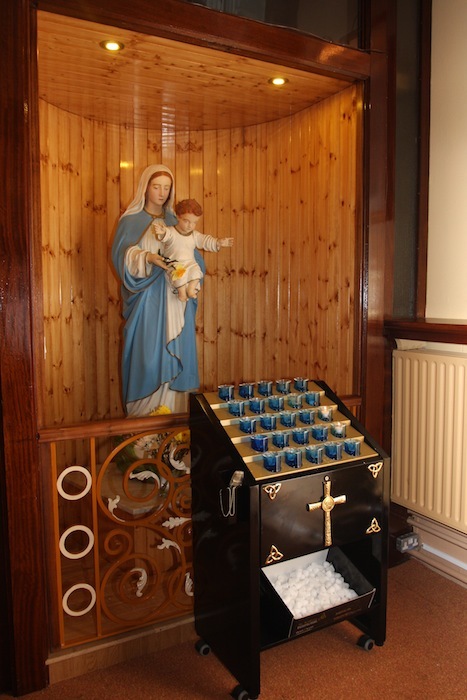 St Michael’s was divided into St Michael’s, Our Lady of Lourdes (1963), St Joseph’s (1973) and St Saviour’s (1973). St Munchin’s was divided into St Munchin’s, Our Lady of the Rosary (1964), Christ the King (1970) and Corpus Christi (1976). 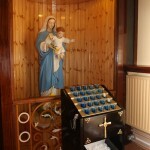 St Patrick’s was divided into St Patrick’s, Monaleen (1971), and Our Lady Help of Christians (1981). St John’s parish has not been altered. 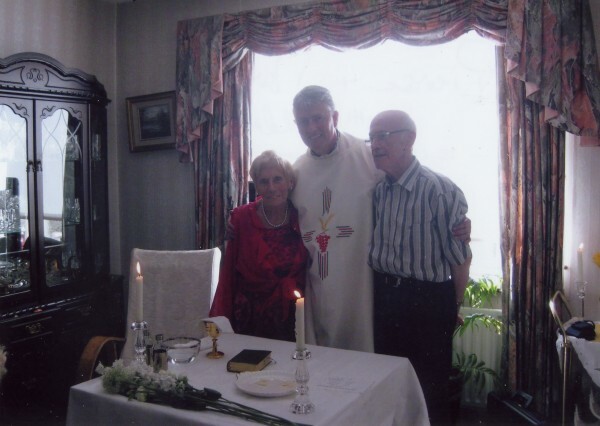 St Paul’s was formerly part of the parish of Mungret/Crecora and was created in 1971. The church for St Laurence’s was near Limerick prison in St John’s parish and was destroyed in 1651. St Joseph’s church was built in 1904. It was originally used as a chapel of ease for St Michael’s parish church. 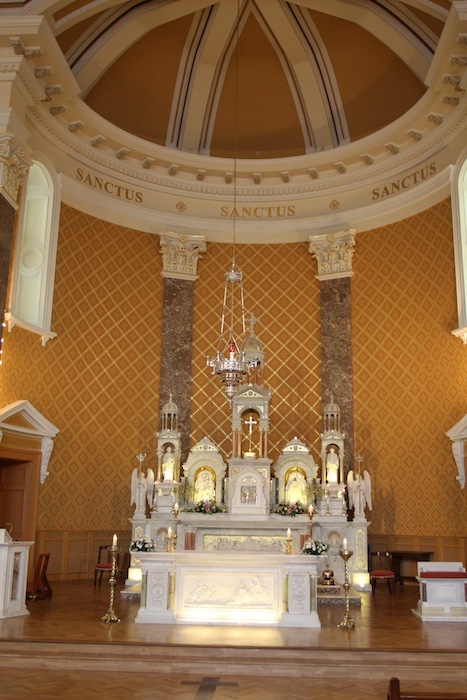 At the turn of the century, it was decided to build a new church to accommodate the growth of St Michael’s parish. The architect of the church was Mr W E Corbett and the builders were John Ryan & Sons. Mr Byrnes gave the site for the church. According to the original plan, the church would be built in two stages. 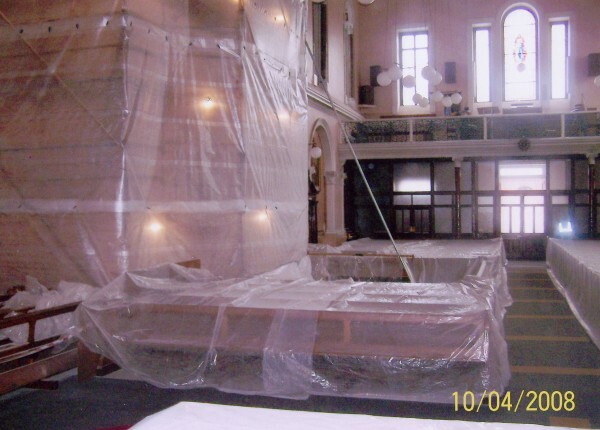 The second stage was to begin when the money had been raised to finish the church. 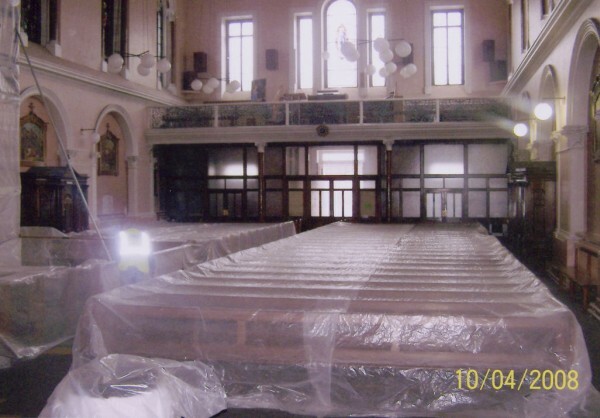 However, when the first stage was completed, the church did not look aesthetically pleasing and it was decided to borrow the remaining money to finish the church. The church has acquired the nickname ‘the church of the spite’ because it is situated across the road from the Jesuits’ Church of the Sacred Heart. At the time of the building of St Joseph’s, the then bishop, Bishop O’Dwyer objected to the Jesuits using a two-tier system for worshippers. The wealthy people sat at the front of the church while the ordinary people sat at the back. 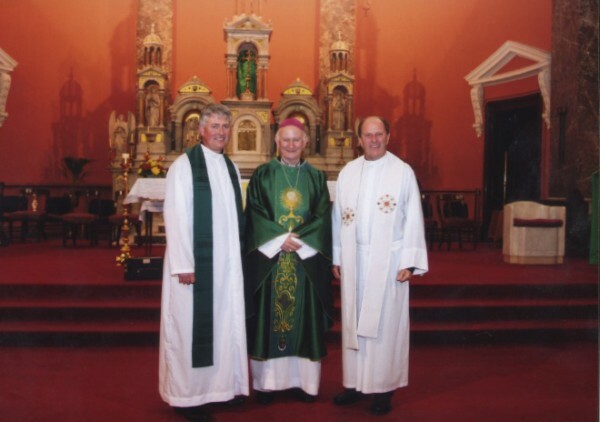 Despite attempts from Bishop O’Dwyer, the Jesuits refused to change this system and it was decided that a new church was needed which would not have this practice of separation. 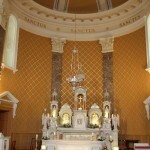 The church is of Italian Neo-classical design and is cruciform in shape. 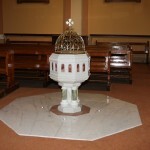 It was built using Limerick limestone. Outside the church on the right, there is a statue of Christ the King, which was erected in 1930. On the pediment of the church, there is a mosaic of St Joseph holding the child Jesus. This mosaic is dated from the early 1960s. Over the main entrance, there is a stained glass window of the Virgin Mary. The church has a number of Romanesque style windows. On the left of the church, there is a picture of the Mother and Child. There are five stained glass windows in the left transept, which depict (clockwise) the Presentation of Our Lord in the Temple, the visit of the Angel Gabriel to Mary, Lourdes to the memory of Fr Denis Hallinan, the Three Wise Men and the Sacred Heart. 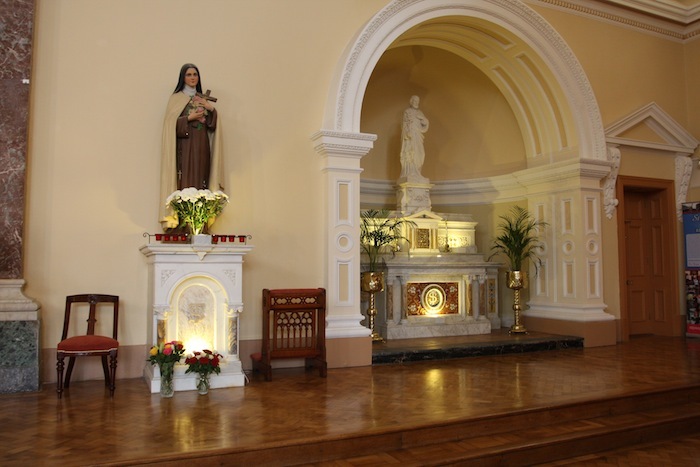 To the left of the high altar, there is a statue of St Therese of the Child Jesus, while nearer the altar, there is a statue of Sacred Heart. 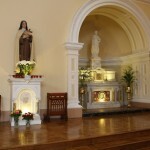 To the right of the high altar, there is a statue of Mary and the Infant Jesus and further right there is an altar to St Joseph. Inside the main door, to the right, there is a painting of Joseph and the Infant Jesus. There is a stained glass window of the washing of the feet at the Last Supper. This window is in memory of Cornelius and Johanna Devane. Another stained glass window is of St Patrick. This window is the work of the Harry Clarke studio. In the right transept, there are five stained glass windows. They are (clockwise) Jesus comforting the dying, Joseph showing Jesus the trade of carpentry, Jesus ascending into Heaven, Jesus and Roman soldiers and the Crucifixion of Jesus. There is a stained glass window of Mary ascending into Heaven over the main door of the church. 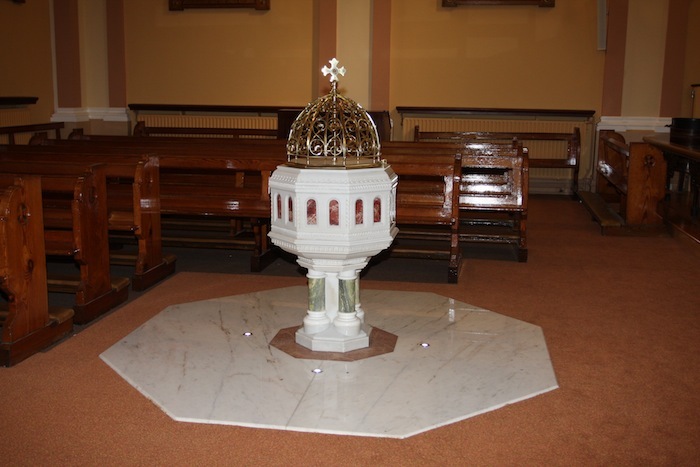 The stunning high altar is made from different kinds of marble. The front of the altar is decorated with a carving of the Last Supper. There is a stained glass window of an angel on either side of the apse. There is also a carving of an angel at either side of the high altar. 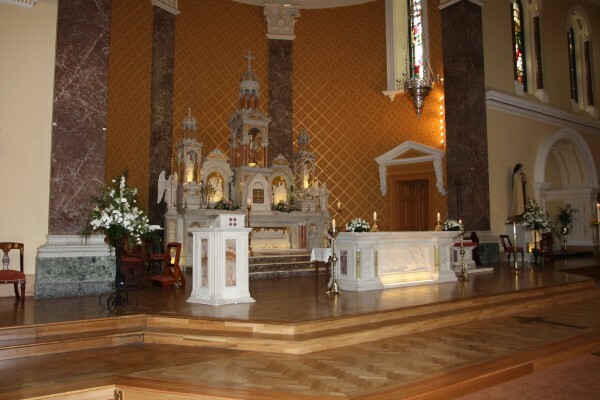 There is a statue of St Peter and one of St Paul to the left and right of the altar. 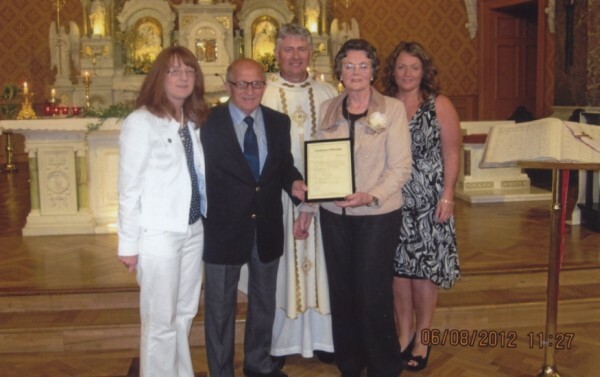 The sanctuary lamp was donated to the church in memory of James and Hanora O’Mara by their children. Egan’s jewellers of Cork carried out the work.